Flower: brilliant vermilion, deep red, 1-1-1/2 inch long, with long stamens projected through a split in the upper lip. Range in New Jersey: Throughout New Jersey, except in the Pine Barrens, except as an indicator of disturbance. Misc. 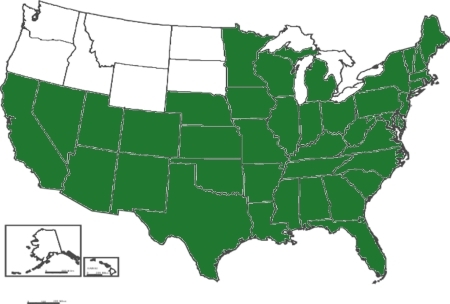 USDA lists as FACW+. Usually occurs in wetlands (estimated probability 67%-99%), but occasionally found in non-wetlands. Wildlife: Hummingbirds are attracted to the nectar. Deer browsing often damages young plants. 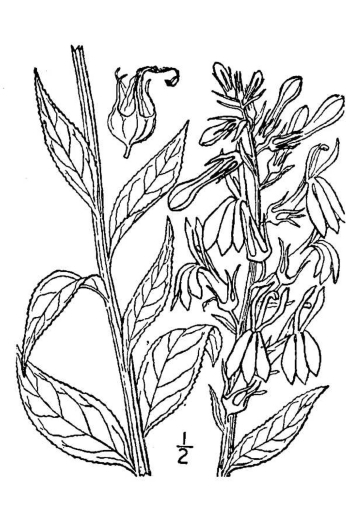 Adaptation: Cardinal flower is comparatively easy to grow. The capsules can be collected in autumn, usually October. The stalks are cut below the capsules, and placed upside down in a per sack. Once, home, the bag is opened so that the capsules are exposed to the air for a few days. Shake the bag to release the seeds. Crushing the capsules with a rolling pin and picking out the seeds from the litter can retrieve the capsules that have remaining seeds. The seeds can then be planted right away. Propagation by seeds: The seeds will germinate without cold stratification, but they need light, so sow the seeds in a flat with a damp fine grade peat light mix. Keep the flats moist and under lights or in a greenhouse. They should green up in a few weeks. well to keep the soil cool and moist. Protect the plants from deer. Cardinal flower will take two years to bloom, forming a large rosette the first year. Allow the plants to self-sow. They are heavy feeders, so compost or a shot of granular fertilizer when they begin growth is recommended. Propagation by cuttings: Take two node stem cuttings (4-6 inches) before the flowers open and remove the lower leaf and half the upper leaf. Treat the cutting with hormodin 2 or roottone and place the cuttings in a sand and perlite medium, cover lightly, water, and remember to keep the medium moist. Roots will form in 2-3 weeks, but the cuttings need to force a good new crown from the lower node to successfully over-winter. at the base of the drying stems of old plants free of leaf litter to allow them full exposure to the air and sunshine.